You are here: Home / Downloads / Printables / Free Charlotte Mason Printables & Updates! For those who are subscribed to my mailing list, I sent out a new-old, free download for you a few weeks ago! I actually offered these printables for a month or two last summer, but as my list has grown since then, I thought I might offer them again to those who missed out the first time! 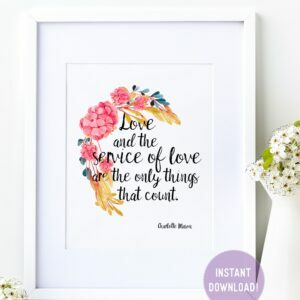 This time around you get three printables, including a PDF with all of Charlotte Mason’s 20 Principles as well as a page each for the List of Formidable Attainments for a Child of Six and What a Child Should Know at Twelve, all on a floral watercolor background. Feel free to print and hang on the wall of your homeschool area for inspiration, or keep them in a binder. I like to keep mine in the front of my homeschool binder where I keep all of our schedules, umbrella school documents, term overviews, etc. If you’re not already subscribed to the list, click on the button below to sign up for (semi-)weekly updates from me with new posts, site announcements, freebies, and more! In other news, 2019 has come in with a bang for me and January and February are proving to be what I assume (hope?) will be my busiest months. I’m hoping for a little more breathing room after that! I have a few updates that I’ll list below because bullet lists are a Type A’s best friend. The John William Waterhouse Picture Study Aid is coming! Generally, I go with our own homeschooling schedule to give myself a deadline of when I need to get these out. We’re right in the middle of Term 2 right now and we’ll begin Term 3 on March 4, so I’ll try to get it out any time before then though I’m obviously hoping sooner rather than later! Someday (hopefully…) I will be not as scattered and have more time and actually get these things done the summer before the school year starts….but I’m not holding my breath on that. An updated Charlotte Mason-Inspired Kindergarten Curriculum for the 2019-2020 school year is coming also! I will be updating a few things for next year and playing along at home as C will be starting kindergarten as well, so I hope to have that posted by March 1st. The Charlotte Mason Educational Retreat is just three weeks away! I help out behind the scenes with this retreat and it is easily one of my favorite weekends of the year. If you’ll be attending, I’ll most likely be hovering around the book sale table in the Pikes Peak room (the one with the snacks 🙂 ), so please stop by and say hello! On the topic of the retreat, however, and because it’s coming up quickly, I may be quiet here on the blog for the next few weeks. Even when I’m quiet here, though, I’m still around on Instagram! I think that’s all for now… enjoy your downloads!